Clothes for a Cause, a club based out of Fairfield Ludlowe High School, will be running a “Spring Cleaning” Clothing Drive. 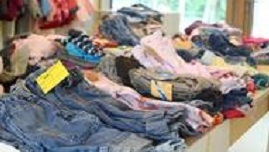 They will be collecting gently used articles of clothing, shoes, and backpacks, of all sizes and for both genders. Donations will be sent to organizations that cater to those in need in Guatemala, Syria, and other countries. The collection box is located in the back of the church. If you have further questions, please email kaleigh3brown@gmail.com.